You can pause a subscription incase there are issues with receiving payments from your customer, so until you have resolved the payment issues, you can keep the subscription on hold. Subscriptions placed on pause will not be accounted in Churn, hence your reports will be accurate and will reflect the right numbers. Such subscriptions will also be identified by a distinct status - paused. This will help in tracking these subscriptions in Chargebee and communicate better with 3rd party systems. Say, an order tracking system can identify whether to ship the goods or not for that period based on whether the subscription is paused. You can pause the subscription from your Chargebee site or via API. Your customers can also pause the subscription via the Customer Self-serve Portal. Subscriptions can be placed on pause for a defined period if the resume date is known, else can be placed on pause indefinitely. Chargebee will not provide credits for the unused billing period. However, you can choose to manually provide credits to your customers, if required. You can enable Pause subscription in your Chargebee site at Settings > Configure Chargebee > Pause Subscription > Enable. or Pause on Next renewal. or pause till a specific date. or Resume on Next renewal. If there are unpaid invoices from previous terms You can choose what happens to the unpaid invoices from the previous terms of the subscription. On resumption, all the current term invoices will be collected. ​​You can choose to allow overriding the default settings via the Chargebee site and-or via API, when a subscription is paused/resumed. When overriding is locked, users will not be able to change the settings. Only subscriptions in ACTIVE state can be paused. Navigate to the subscription details page. Click the Pause Subscription button on the action pane on the right. The defaults defined in Chargebee settings will be preloaded and the necessary options can be overridden, if allowed. Immediately: The subscription will be paused immediately. Prorated credits will not be given when the subscription is paused. End of term: Subscription will be paused at the end of the current billing term. Scheduled: The subscription can be scheduled to pause on a specific date. If the subscription is scheduled to be paused, it'll override other changes that were scheduled for the said subscription and will prevent further changes as well. Say, you're scheduling an upgrade and later scheduled a pause. In this case, the subscription upgrade will not take place, and will be paused instead. Set Resume Date: If you know when you want to resume the subscription, you can set the date here, else you can resume later. If the resume date is not mentioned, subscription will be placed on pause indefinitely. 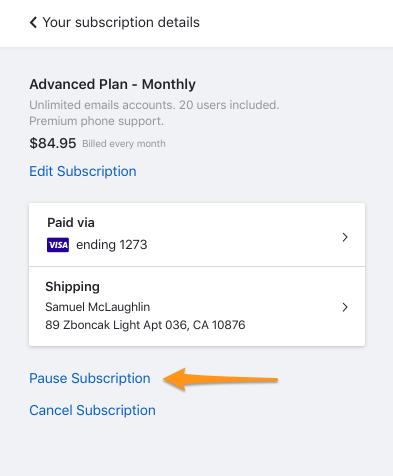 You can pause the subscription via the Pause Subscription API . If the settings allow, then your customers can Pause or Resume subscriptions from the Hosted Pages Portal. Your customers can choose to pause the subscription immediately or end of the current billing term. They can also choose to resume a paused subscription manually or on specific date. Subscription renewals will not go through if the subscription is paused. Subscription renewal reminder emails will not be sent to the customer during the pause period. Unbilled charges linked to the subscription will be invoiced when the subscription is resumed post the billing term. Whenever you resume the subscription, the billing cycle will remain intact. Managing the billing cycle of a paused subscription depends on the subscription period of the plan. For a monthly plan, pausing the subscription for 2 months, will not affect the billing cycle of the subscription. However, for a yearly plan, pausing the subscription for 2 months will mean that you customer is losing 2 months of service period. Change subscription will not be allowed when the subscription is paused. You can make changes once the subscription resumes. Scheduled subscription changes (except cancellation) will be removed when the subscription is paused or scheduled to be paused. Subscription cancellation (whether immediate or scheduled) will take place even if the subscription is on pause or scheduled for a pause. Advance invoices cannot be raised on a subscription that's on pause. If there are any advance invoices raised on a subscription that's paused later, credits will be created for the invoice. Next billing date cannot be changed if the subscription is on pause. However, if the subscription is scheduled to be paused at the end of term, the next billing date can be changed to a date that falls within the date of resumption. Record payment, write-off or void can be performed on past invoices linked to the paused subscription. Invoice now: You can choose to invoice the unbilled charges linked to the invoice right when the subscription is paused. If the subscription's Auto Collection is ON, Chargebee will try and collect the payment. If the payment fails, or Auto Collection is OFF, invoice will be closed and marked as Unpaid. Retain as Unbilled: If you choose to retain the unbilled charges, the charges will be invoiced when the subscription resumes and the charges will be added in the next invoice raised - on resumption (if out of term) or the next invoice raised post resumption or can be invoiced manually. Also the user can choose to retain resumption charges as unbilled. When the subscription is paused, you can choose to continue dunning or stop dunning for related invoices. 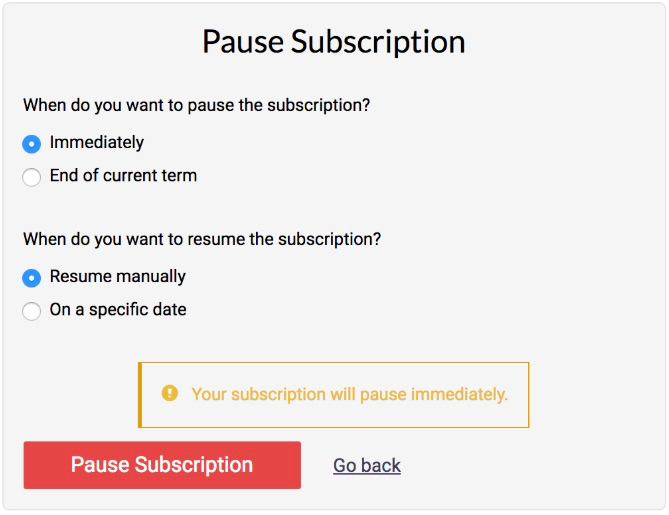 If you choose to continue dunning for a paused subscription, the final action will override even if the subscription is on pause. If you have enabled Consolidated invoicing and choose to stop dunning for a paused subscription, Chargebee will check if there is at least one active subscription listed in the invoice, and will not stop dunning for the said invoice. However, the said subscription will be paused. MRR of a paused subscription will be considered as $0 and will be accounted only on resumption. Subscriptions on pause will not show up in reports as churn. You can filter the subscriptions that are paused. If a discount is applied to a subscription and the subscription is paused, the coupon duration will not be extended. The coupon may expire even if the subscription is paused. A subscription in paused state can be resumed at any point in time. If your customer has requested to resume or payment issues have been resolved, or any other reason due to which the product/service should begin to be delivered, you can resume the subscription in Chargebee. Immediate: You can resume the subscription immediately. Scheduled: You can schedule a subscription to be resumed on a specific date. For a scheduled resumption, the resumption date can be updated even when the subscription is on pause. If a resume date is defined at the time of pause, the date will be preloaded and you can choose to modify it. If resume date wasn't mentioned, the subscription will be paused indefinitely. You can choose a new resume date or resume immediately. 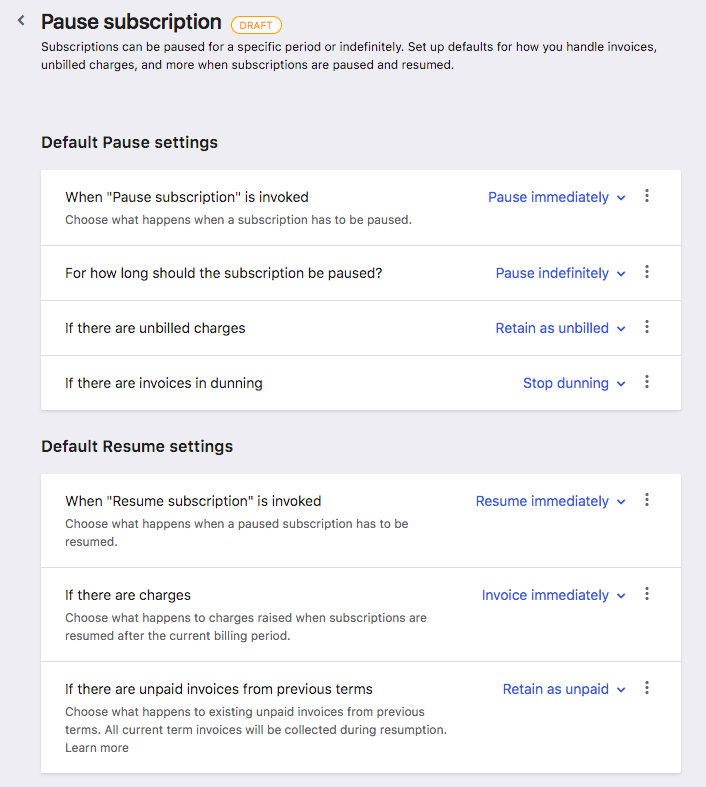 You can resume a paused subscription immediately or on a specific date. You can choose to invoice the charges immediately or add to unbilled charges. You can resume a paused subscription via the Resume Subscription API . If you have Portal v2 enabled for your Chargebee site, your customers can resume the subscription from the portal (immediately or schedule resumption on a specific date). This is when a subscription is paused and resumed within the billing term of the subscription. Say, the subscription renews on the 1st of every month. If the subscription is paused on 15th and resumed on the 25th, this is considered as an in-term resumption. When a subscription resumes in-term, new charges will not be created. If the payment does not go through, Chargebee will hold the subscription on pause. When a paused subscription resumes after the renewal date, it is considered as an out-of-term resumption. Say, the subscription renews on the 1st of every month. If the subscription is paused on the 15th and resumed on the 10th of the next month, this is considered as an out-of-term resumption. A new invoice will be generated on the 10th of March (in this example). If the payment goes through, the subscription will resume, else it will remain paused. The collection of the invoice generated on the 1st of Feb will be scheduled as soon as the subscription resumes. If Calendar billing is enabled, subscription term will align with the billing date and charges will be raised accordingly. If Calendar billing is not enabled, the renewal date will be set as resumption date. For instance, a subscription which renews 1st of every month was resumed (from paused state) on the 10th of the next month, the subscription renewal date will now be updated to 10th. You will no longer be able to pause subscriptions. Subscriptions that are currently paused will resume as scheduled, or can be resumed manually. 1. What will happen to the non-recurring charges if the subscription is resumed before the end of the billing term? If the subscription resumes before the end of the billing term, non-recurring charges will not be invoiced right away. Said charges will be added to the invoice of the subscription renewal.